The passage now began to slope upwards; they groped onward a little further, and then the noise broke out again, quite distinct this time, and very close above them. 'Ooo-ray-ooray-oo-ray-ooray!' they heard, and the stamping of little feet on the floor, and the clinking of glasses as little fists pounded on the table. 'WHAT a time they're having!' said the Badger. 'Come on!' They hurried along the passage till it came to a full stop, and they found themselves standing under the trap-door that led up into the butler's pantry. Well might the terrified weasels dive under the tables and spring madly up at the windows! Well might the ferrets rush wildly for the fireplace and get hopelessly jammed in the chimney! Well might tables and chairs be upset, and glass and china be sent crashing on the floor, in the panic of that terrible moment when the four Heroes strode wrathfully into the room! The mighty Badger, his whiskers bristling, his great cudgel whistling through the air; Mole, black and grim, brandishing his stick and shouting his awful war-cry, 'A Mole! A Mole!' Rat; desperate and determined, his belt bulging with weapons of every age and every variety; Toad, frenzied with excitement and injured pride, swollen to twice his ordinary size, leaping into the air and emitting Toad-whoops that chilled them to the marrow! 'Toad he went a-pleasuring!' he yelled. 'I'LL pleasure 'em!' and he went straight for the Chief Weasel. They were but four in all, but to the panic-stricken weasels the hall seemed full of monstrous animals, grey, black, brown and yellow, whooping and flourishing enormous cudgels; and they broke and fled with squeals of terror and dismay, this way and that, through the windows, up the chimney, anywhere to get out of reach of those terrible sticks. The Mole vanished promptly through a window; and the Badger bade the other two set a table on its legs again, pick up knives and forks and plates and glasses from the debris on the floor, and see if they could find materials for a supper. 'I want some grub, I do,' he said, in that rather common way he had of speaking. 'Stir your stumps, Toad, and look lively! We've got your house back for you, and you don't offer us so much as a sandwich.' Toad felt rather hurt that the Badger didn't say pleasant things to him, as he had to the Mole, and tell him what a fine fellow he was, and how splendidly he had fought; for he was rather particularly pleased with himself and the way he had gone for the Chief Weasel and sent him flying across the table with one blow of his stick. But he bustled about, and so did the Rat, and soon they found some guava jelly in a glass dish, and a cold chicken, a tongue that had hardly been touched, some trifle, and quite a lot of lobster salad; and in the pantry they came upon a basketful of French rolls and any quantity of cheese, butter, and celery. They were just about to sit down when the Mole clambered in through the window, chuckling, with an armful of rifles. 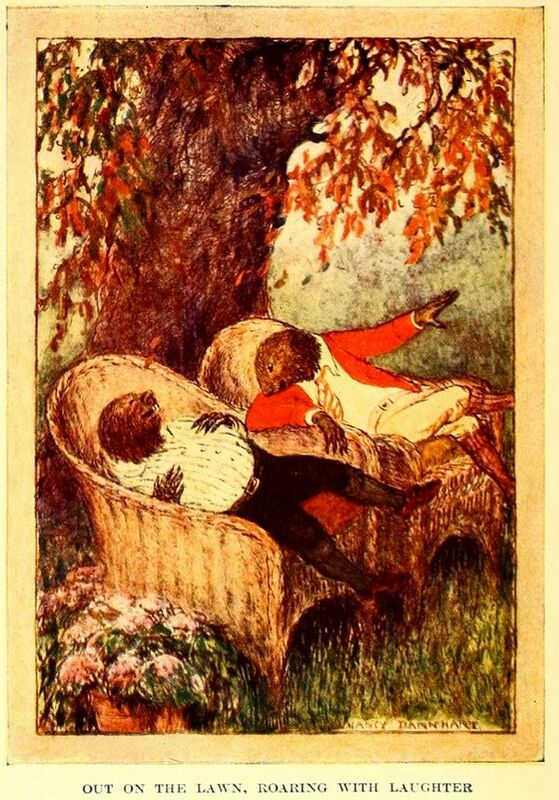 Then the Mole pulled his chair up to the table, and pitched into the cold tongue; and Toad, like the gentleman he was, put all his jealousy from him, and said heartily, 'Thank you kindly, dear Mole, for all your pains and trouble tonight, and especially for your cleverness this morning!' The Badger was pleased at that, and said, 'There spoke my brave Toad!' So they finished their supper in great joy and contentment, and presently retired to rest between clean sheets, safe in Toad's ancestral home, won back by matchless valour, consummate strategy, and a proper handling of sticks. SPEECH. . . . BY TOAD. SYNOPSIS—Our Prison System—the Waterways of Old England—Horse-dealing, and how to deal—Property, its rights and its duties—Back to the Land—A Typical English Squire. will be sung in the course of the evening by the. . . COMPOSER. The idea pleased him mightily, and he worked very hard and got all the letters finished by noon, at which hour it was reported to him that there was a small and rather bedraggled weasel at the door, inquiring timidly whether he could be of any service to the gentlemen. Toad swaggered out and found it was one of the prisoners of the previous evening, very respectful and anxious to please. He patted him on the head, shoved the bundle of invitations into his paw, and told him to cut along quick and deliver them as fast as he could, and if he liked to come back again in the evening, perhaps there might be a shilling for him, or, again, perhaps there mightn't; and the poor weasel seemed really quite grateful, and hurried off eagerly to do his mission. As soon as the meal was over, Toad thrust his paws deep into his trouser-pockets, remarked casually, 'Well, look after yourselves, you fellows! Ask for anything you want!' and was swaggering off in the direction of the garden, where he wanted to think out an idea or two for his coming speeches, when the Rat caught him by the arm. 'Mayn't I sing them just one LITTLE song?' he pleaded piteously. At last the hour for the banquet began to draw near, and Toad, who on leaving the others had retired to his bedroom, was still sitting there, melancholy and thoughtful. His brow resting on his paw, he pondered long and deeply. Gradually his countenance cleared, and he began to smile long, slow smiles. Then he took to giggling in a shy, self-conscious manner. At last he got up, locked the door, drew the curtains across the windows, collected all the chairs in the room and arranged them in a semicircle, and took up his position in front of them, swelling visibly. Then he bowed, coughed twice, and, letting himself go, with uplifted voice he sang, to the enraptured audience that his imagination so clearly saw. 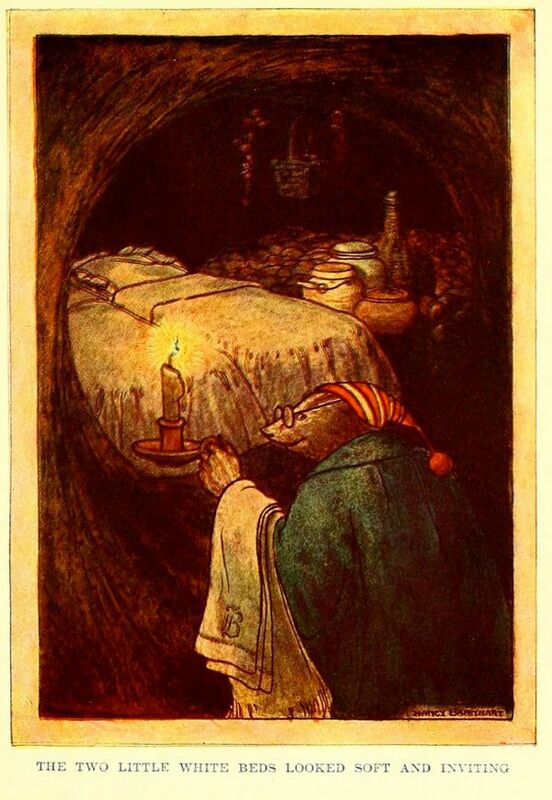 All the animals cheered when he entered, and crowded round to congratulate him and say nice things about his courage, and his cleverness, and his fighting qualities; but Toad only smiled faintly, and murmured, 'Not at all!' Or, sometimes, for a change, 'On the contrary!' 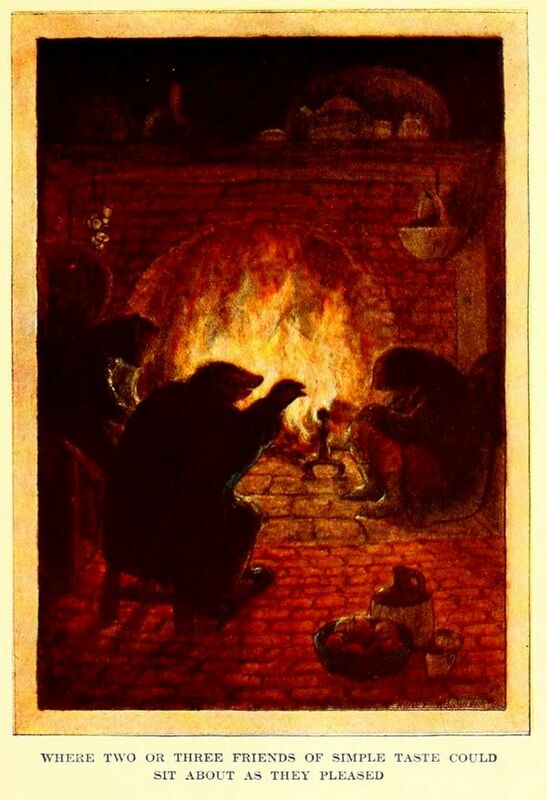 Otter, who was standing on the hearthrug, describing to an admiring circle of friends exactly how he would have managed things had he been there, came forward with a shout, threw his arm round Toad's neck, and tried to take him round the room in triumphal progress; but Toad, in a mild way, was rather snubby to him, remarking gently, as he disengaged himself, 'Badger's was the mastermind; the Mole and the Water Rat bore the brunt of the fighting; I merely served in the ranks and did little or nothing.' The animals were evidently puzzled and taken aback by this unexpected attitude of his; and Toad felt, as he moved from one guest to the other, making his modest responses, that he was an object of absorbing interest to every one. The Badger had ordered everything of the best, and the banquet was a great success. There was much talking and laughter and chaff among the animals, but through it all Toad, who of course was in the chair, looked down his nose and murmured pleasant nothings to the animals on either side of him. At intervals he stole a glance at the Badger and the Rat, and always when he looked they were staring at each other with their mouths open; and this gave him the greatest satisfaction. Some of the younger and livelier animals, as the evening wore on, got whispering to each other that things were not so amusing as they used to be in the good old days; and there were some knockings on the table and cries of 'Toad! Speech! Speech from Toad! Song! Mr. Toad's song!' But Toad only shook his head gently, raised one paw in mild protest, and, by pressing delicacies on his guests, by topical small-talk, and by earnest inquiries after members of their families not yet old enough to appear at social functions, managed to convey to them that this dinner was being run on strictly conventional lines. Sometimes, in the course of long summer evenings, the friends would take a stroll together in the Wild Wood, now successfully tamed so far as they were concerned; and it was pleasing to see how respectfully they were greeted by the inhabitants, and how the mother-weasels would bring their young ones to the mouths of their holes, and say, pointing, 'Look, baby! There goes the great Mr. Toad! And that's the gallant Water Rat, a terrible fighter, walking along o' him! And yonder comes the famous Mr. Mole, of whom you so often have heard your father tell!' But when their infants were fractious and quite beyond control, they would quiet them by telling how, if they didn't hush them and not fret them, the terrible grey Badger would up and get them. This was a base libel on Badger, who, though he cared little about Society, was rather fond of children; but it never failed to have its full effect.